Looking for fun for the whole family? You don’t have to go to a galaxy far, far, away! 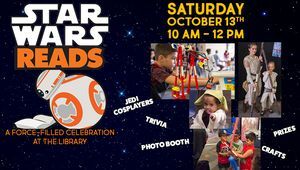 Join us at Victoria Public Library for Star Wars Reads on Saturday, October 13 from 10 AM to 12 PM. Come in your best intergalactic costume—you could take home stellar prizes. At this FREE event you’ll find family-friendly crafts, out-of-this world activities, refreshments and tons of photo ops!